Voice calls are an important part of the mobile communication systems. Although data traffic already overshadowed voice traffic, users still need legacy services like voice and SMS. When 3GPP designed LTE, it gave a lot of importance for better data throughput. The goal was to achieve highest data rate with the lowest latency. 3GPP did not have design requirements for voice and other CS services like SMS. LTE is an all-IP network. To support CS services, it needs to support voice over internet protocol (VoIP). LTE achieves this with the help of IP Multimedia Subsystem or IMS. IMS is not new to 3GPP, and it was first introduced in 3GPP release 5, way back in 2000. 3GPP introduced IMS in the Release 5 specifications to support IP based services. But, there were no proper instructions to use it with LTE to support voice. There was no clear voice solution for LTE at the time of the initial release of the specifications. So during the initial deployments, operators used CS Fallback as an intermediate solution. In CS Fallback, when a user starts a voice call in an LTE network, the network moves the user to a legacy system like UMTS or GSM to complete the call. The user remains in the legacy during the whole duration of the call. After terminating the call, the network moves the user back to LTE network. Though CS Fallback solves LTE’s voice call problem, it has its drawbacks. For example, if a UE moves to a 2G network to complete a voice call, it cannot connect to the internet. Many 2G networks like GSM do not support simultaneous CS and PS connectivity. In the year 2009 12 major telecom companies collaborated together and proposed a solution to support voice over LTE network. The solution was based on IMS and the initiative was called One Voice. One Voice proposal was to use the existing specifications to provide a common solution for voice over IP network. In February 2010, GSMA (Global System for Mobile Communication) took over the proposal. GSMA goal was to make the solution official for general use. At the time of release, GSMA VoLTE solution got the support of 40 organizations around the world. In March 2010 GSMA published IR 92. IR 92 defines a standardized IMS profile to support voice and SMS. It uses 3GPP, ITU and IETF specifications. In September 2010, GSMS froze the first version of the IR 92 reference document. 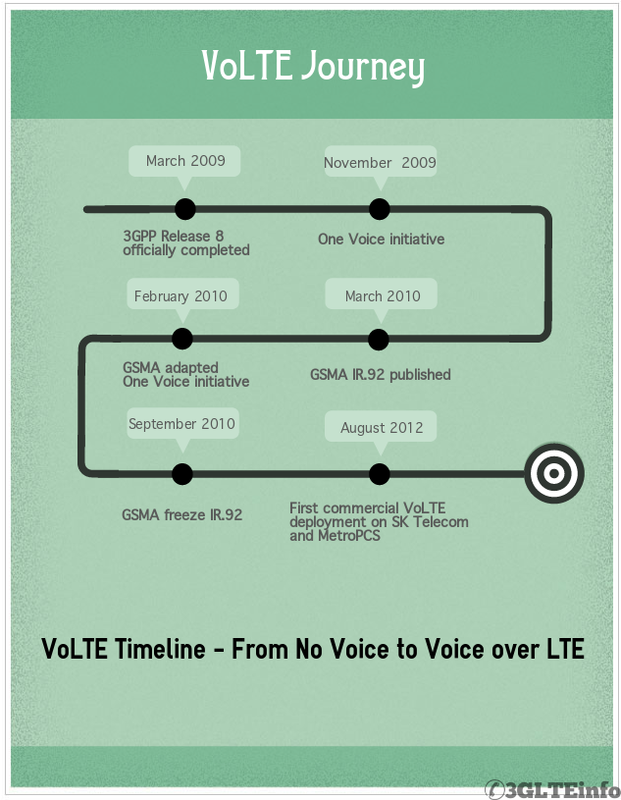 The following diagram shows the timeline of VoLTE initiative. So the reference standard for VoLTE is IR.92? there is any reference standard for ViLTE?